...and the workplace of today and tomorrow will continue to change as more and more people with autism enter the workforce. Are you ready for it? 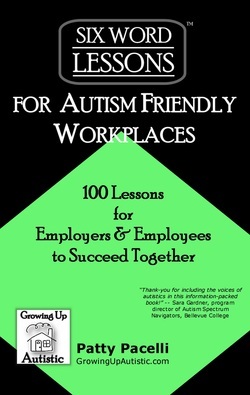 Six-Word Lessons for Autism Friendly Workplaces gives you 100 insightful lessons on topics such as disability laws, reasonable accommodations, unwritten social expectations and best and worst jobs for people with autism. It is for employers who interview, hire and work alongside those on the autism spectrum, and it will also help adults with autism find the perfect job and seamlessly fit into the workplace. This book will lead to a productive workplace for everyone. Written by Patty Pacelli, the mother of Trevor, an autistic young adult who will soon be graduating from college and entering the workforce. This book will help people like Trevor succeed in careers, and will help employers understand how to have a productive workplace while integrating employees with autism.